Evil Ways is a high-energy tribute to the music of Santana, featuring some of Northern Ohio's most exciting and experienced musicians. Evil Ways approaches each memorable Santana tune with a dedication and motivation to making each performance perfect. Blues circuit legend Mike Goldberg has an uncanny ability to recreate the style and sound of Carlos Santana's fabled guitar. The band has received high praise and critical acclaim from respected venues like House of Blues, Lock 3 Live and the Rockin' on the River Festival. Evil Ways is ready to take its place among the ranks of truly outstanding and memorable national tribute aritists. 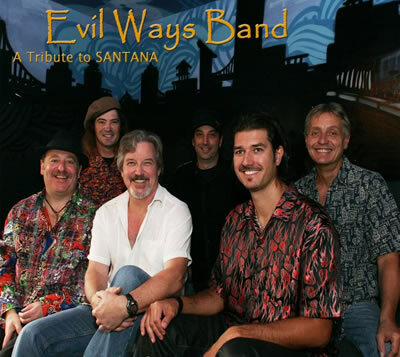 A performance by Evil Ways includes all of the Santana hits, performed with authenticity and exuberance that will bring audiences to their feet in appreciation. Stunning instrumentals, high-energy drumming and percussion, a live horn section and of course the legendary sound of the guitar, all come together to bring the SANTANA concert experience to life for an event you will not soon forget! To learn more about Evil Ways, contact Conn Entertainment at 216.849.3545.